Special emphasis is given on building up a complete collection of maps relevant to Sri Lanka. Building up of a map collection commenced in 1980. 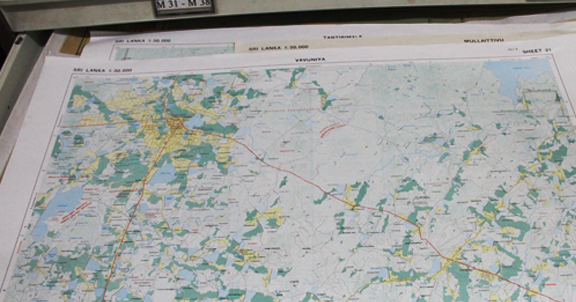 Majority of the maps are published by the Survey Department of Sri Lanka with different scales. The map collection comprises of world maps, Ceylon maps, maps of India and various other countries. Maps in this collection already divided, to name them. One inch maps – scale 1:63500, Sri Lanka Metric Maps – scale 1:50000, Land use maps, Historical maps, Satellite maps, Road maps, Provincial wise maps, District wise maps, Divisional Secretarial wise maps, etc.